All BMW All Weather E46 Floor Mats are sold per front pair or per rear pair. To purchase a complete set, place the front pair in the cart, hit the back button then place the rear pair in the cart. You will only be charged once for shipping. Toss your stained floor mats you have in your E46 right now and replace them with a set of OEM BMW E46 All Weather Floor mats. 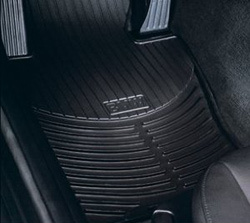 These floor mats are 100% genuine BMW OEM part and feature rubber grooves designed to trap dirt, snow, and water. Both front and rear E46 All Weather Mats have the BMW logo inscribed. All mats are sold per front pair or per rear pair.